Create mixed media paintings, exploring a special batik look technique with Japanese Masa rice paper mounted on canvas. The “dropped-in color” watercolor technique process will be investigated on the Masa paper support with a variety of watermedia hues. This method involves hue fusion, allowing the water to move color on the paper surface to create interesting values changes, color mixtures, and textures. Colored pencils, ink lines and collage elements will be added to embellish the shapes. The artwork will be sealed with an acrylic varnish to protect the surface, producing an alternative to expensive framing methods. Small ephemera stuff like canceled stamps, small images, etc. Helen Shafer Garcia is a painter, mixed media, found object and assemblage artist and award winning illustrator. Her whimsical style shows a love for living creatively with a studio filled to the brim with found objects! She is currently working with watercolor, pastel and mixed media creating contemporary images on paper along with a series of Icon folklore triptychs with wood, watermedia and found object construction. 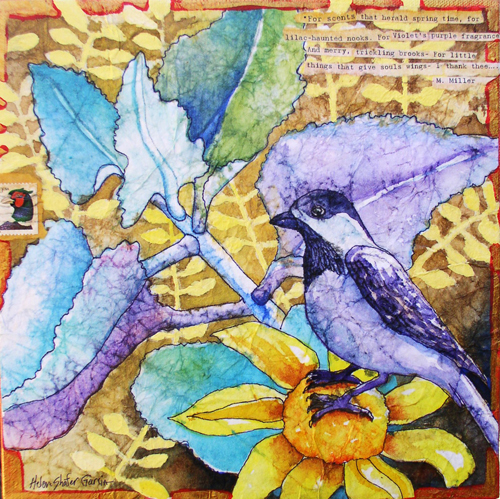 Helen’s watercolor illustrations have graced the cover brochures, garden articlesand advertisements of numerous International resorts and magazines. Awards include four San Diego Press Club First Place Awards of Excellence in Illustration for San Diego Home/Garden Lifestyles Magazine. Helen holds a BA degree in Fine Arts and currently teaches college level watercolor and acrylic painting at Palomar College, San Marcos, CA. 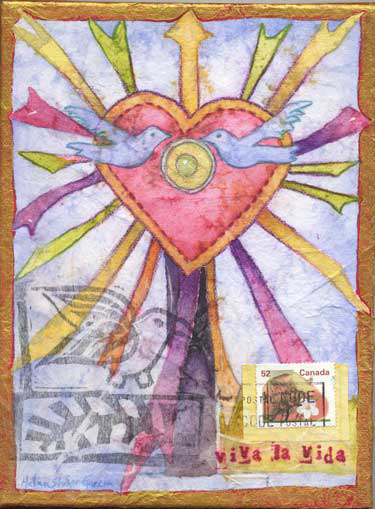 She also teaches mixed media workshops internationally and across the USA. She lives in Vista, California. *$15 materials fee paid at the time of the workshop to the instructor. Add $25 for registration after the earlybird deadline of April 7, 2012.